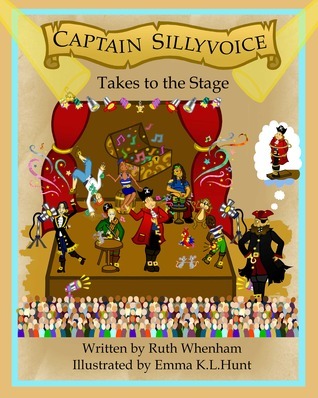 Captain Sillyvoice and his Pirate Band is currently free to download from Amazon. Why not take a look! Offer ends 1 May 2014. ... and a scrumdiddlyumptious time was had by all. So, here I am, seated upon Roald Dahl’s writing chair – a wonderfully comfortable way to write I must say – enjoying a fantastic visit to a little museum in Buckinghamshire (The Roald Dahl Museum). By this point I had already meandered my way happily through a couple of rooms, each jam packed with photos, interview footage and other fascinating archive materials. My family were with me and so a break for refreshments in the Cafe Twit was a must-do. We ordered a couple of deliciously naughty drinks; a swishwiffler and a whizzpopper if I recall correctly! The cakes were scrummy too. Fully sugar-loaded after our break, we were ready for the story time workshop. My daughter was given the role of Little Red Riding Hood; only in Roald Dahl’s version, she is a wonderfully wicked character! If you’ve never read his book, Revolting Rhymes, then I urge you to do so. It really is a master class on how to write in rhyme. The rhythm throughout is superb and the stories are so clever and funny. Needless to say that my daughter had much fun acting the part, especially when she was required to pull a pistol from her knickers to shoot the nasty wolf. It was time to round off the day with a bit of exercise and so we set off on a walk around the village but not just any old walk. Roald Dahl lived and worked for 36 years in Great Missenden, Buckinghamshire and there are places and scenes all around that are said to have inspired his stories. We particularly enjoyed the countryside route that took us through woodlands that were the inspiration for the setting of Fantastic Mr Fox and then through to another wood, said to resemble those described in Danny, Champion of the World. ...and a scrumdiddlyumptious time was had by all. Time for me to get my own thinking cap on now and get writing.